Following the course of the northern wall of the Roman and Medieval city in an easterly direction, a visitor to London passes from Coleman Street Ward into Broad Street Ward. Throughout the Middle Ages, this quarter of London was dominated by "Austin Friars," an Augustinian priory established in the Thirteenth Century by Humphrey de Bohun, Earl of Hereford, on his return from the Seventh Crusade. Like other religious orders, the Augustinians were international in focus, and the sixty friars resident here included Germans and Italians, as well as Englishmen, who took the confessions of their countrymen living in, or visiting London. Plan of Austin Friars (Prioryman, licensed under GNU). 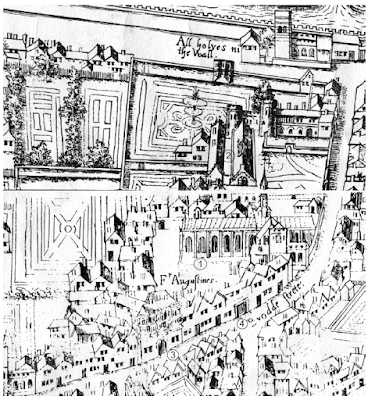 A North Cloister; B Main Cloister; 1 Library; 2 Infirmary; 3 Kitchen; 4 Porter's Lodge; 5 Refectory; 6 Chapter House; 7 Guest Hall; 8 Dormitory; 9 Prior's House; 10 Church of Saint Peter the Poor. Like the Franciscan priory in Farringdon Ward Within, Austin Friars was a significant centre of learning, preparing young men for study at Oxford and Cambridge, and had an important library. The priory garden produced medicinal herbs used by physicians around the city. 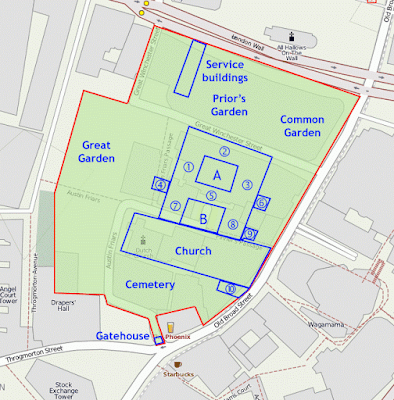 Like many religious houses, also, Austin Friars had property to let out to secular tenants. One resident in the early Sixteenth Century was the Dutch humanist, Desiderius Erasmus, one of the first men to teach Greek in England since the collapse of Roman rule (he left without having paid his bill). Thomas Cromwell and his young family seem to have taken up residence in one of the buildings on the site in the 1520s. The son of a Putney blacksmith, brewer and petty criminal, Cromwell had spent time as a mercenary and administrator in Italy, returning to establish a legal and political career, and with the means to set up home in a fourteen-room property with a garden. His close neighbours included Giovanni Cavalcante, a wealthy Italian merchant; and, from 1529, Eustace Chapuys, the Ambassador of the Holy Roman Emperor in London. 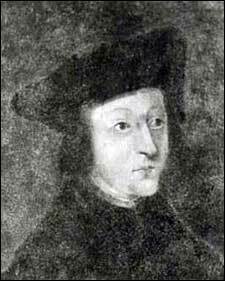 Eustace Chapuys, Ambassador of the Holy Roman Empire in London from 1529 to 1545. Portrait at Annecy (image is in the Public Domain). 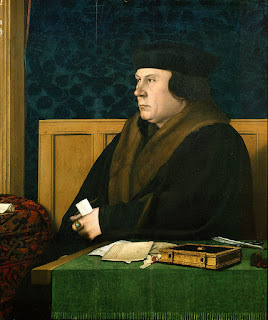 As Cromwell grew in power and influence in the 1530s, he developed his property into one of the grandest private houses in London, with more than fifty rooms, and a much larger garden. This, he did, not at the expense of wealthy neighbours, such as Cavalcante or Chapuys, but rather at the expense of poorer ones, including a tailor, the father of the Elizabethan chronicler, John Stow. "This house being finished," Stow writes, "and having some reasonable plot of ground left for a garden, [Cromwell] caused the pales of the gardens adjoining to the north part thereof on a sudden to be taken down; twenty-two feet to be measured forth right into the north of every man's ground; a line there to be drawn, a foundation laid, and a high brick wall to be built. 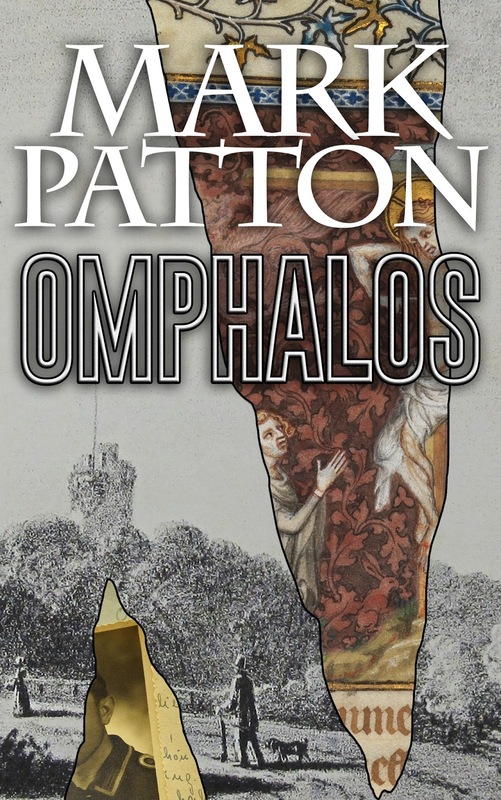 My father had a garden there, and a house standing close to his south pale; this house they loosed from the ground, and bare upon rollers into my father's garden twenty-two feet, ere my father heard thereof. No warning was given him, nor other answer, when he spoke to the surveyors of that work but that their master Sir Thomas commanded them to do so; no man durst go to argue the matter, but each man lost his land, and my father paid his whole rent, which was 6s. 6d. the year, for that half which was left. 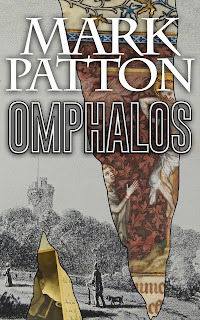 Thus much of mine own knowledge have I thought good to note, that the sudden rising of some men causeth them in some matters to forget themselves." The Augustinian priory itself was dissolved, on Cromwell's orders, in 1538. Some of the most memorable scenes in Hilary Mantel's novels, Wolf Hall and Bring Up The Bodies, are set in Cromwell's home at Austin Friars. Whilst the scenes at court are, in many cases, based on well-attested historical accounts, the domestic setting allows free-rein to Mantel's literary imagination, showing Cromwell, the private man, grieving the loss of his wife and daughters; and exploring his uneasy relationship with his neighbour and political opponent, Chapuys. Thomas Cromwell, by Hans Holbein the Younger, 1532 or 1533, Frick Collection (image is in the Public Domain). 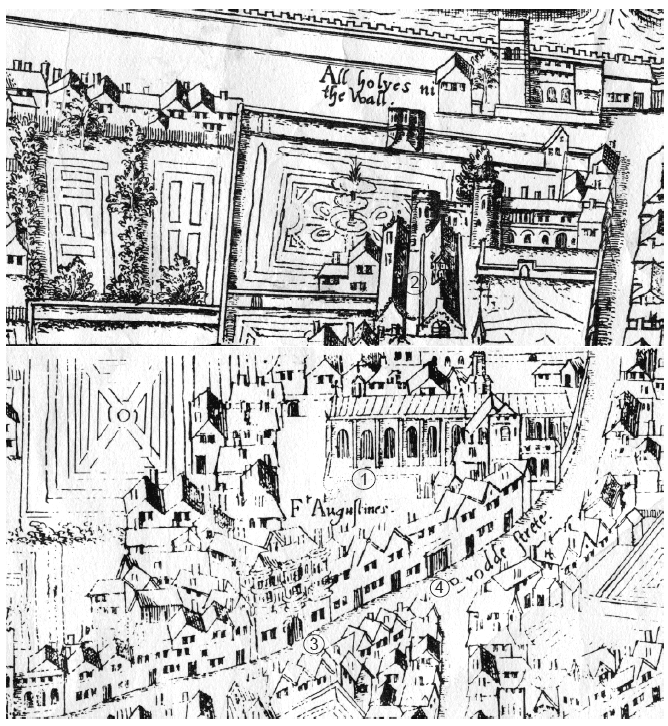 Austin Friars in c1550, Copperplate Map (image is in the Public Domain). Cromwell's former home is at 3. With Cromwell's fall from grace and execution in 1540, his former mansion became the livery hall of the Worshipful Company of Drapers (it subsequently burned down in the Great Fire of 1666). Most of the Augustinian priory had already been demolished, but the nave of the priory church was granted to London's community of "Germans and other foreigners," becoming, in effect, London's first non-conformist chapel. By 1570, the Dutch were the largest group of expatriates in London (5000 out of a total population of 100,000 - around half of them Protestant refugees from the Spanish Netherlands). 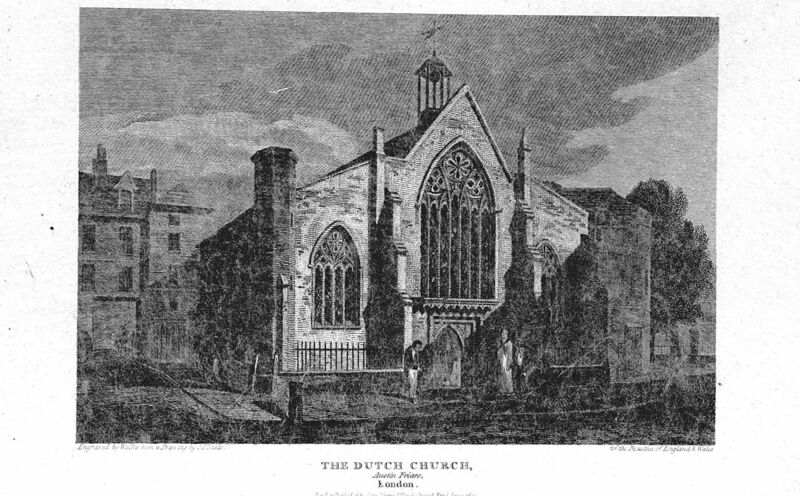 The "Dutch Church," as it became known, remained in use until its destruction during the Second World War (the church that stands on the site today was built in the 1950s). Apart from street-names (Austin Friars, Throgmorton Street, Old Broad Street), there is little on the ground today that Cromwell, Chapuys or Stow would recognise. The Dutch Church in 1820, by Edward Wedlake Brayley, British Library (image is in the Public Domain). I've read so many stories, seen so many movies. England's history never ceases to fascinate me. When I visited many years ago, my favorite thing to do (especially in London, but really anywhere), was to find the spot where I knew history had happened, and just..be there. Thanks, as always, for your posts. The one problem with the Stow account was that Cromwell was an expert in 'conveyancing', he had plenty of money and it was not in character or in his interests to indulge in such petty transgressions. It risked providing his enemies with ammunition. A lovely account and thank you for it. An interesting point: the aftermath of the Dissolution of the monasteries must have involved one of the greatest conveyancing exercises in British history. We don't know (or, at least, I don't) whether Stow Senior was a leaseholder from the priory (as I assume he was), and, if so, on what terms.